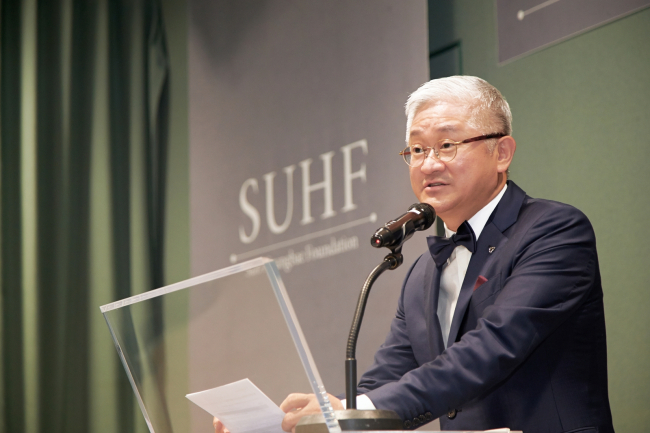 A foundation led by Suh Kyung-bae, the chairman and CEO of cosmetics giant Amorepacific, has awarded research grants to five up-and-coming scientists in an effort to support their work and advance the life sciences, the Suh Kyung-bae Foundation said Monday. The Suh Kyung-bae Foundation, a public trust established in 2016 with a mission to contribute to humanity by supporting innovative scientists in making discoveries, said the five scientists were selected for “Young Investigator” awards on the basis of the innovative nature of the research they carried out. Each scientist will be offered 300 million to 500 million won ($265,000 to $442,000) in annual research grants over the next five years, the foundation added. A total of 9.2 billion won has been spent on research grants through the program since last year’s five winners were similarly honored. The foundation said this year’s winners included life sciences professor Kim Jin-hong from Seoul National University, who studied “the origin of regeneration signal(s) from damaged connective tissue that specifies endogenous stem cell differentiation.” The professor was selected because his findings could be expected to contribute to the regenerative therapy field in Korea, the foundation said. “Our foundation has a stern mission to support scientists and their great achievements. We will continue to wholeheartedly fund rising scientists and their studies, which will be new seeds for the next generation,” said Suh Kyung-bae in a statement.